Are you considering implementing math workshop or guided math in your classroom this year? This e-book is full of tips and free math resources to get you started! Math workshop and guided math are great ways to reach and teach each of your students at their instructional level using guided math groups and differentiated math stations. To help you get started, 20 wonderful TpT sellers collaborated to bring you tips and tricks for starting, organizing, and maintaining a math workshop. And, because math stations are an important component of math workshop, we've included links to free math workshop stations! ♥ Thank you for downloading our Math Workshop E-book. We hope you find some useful tips and resources inside! 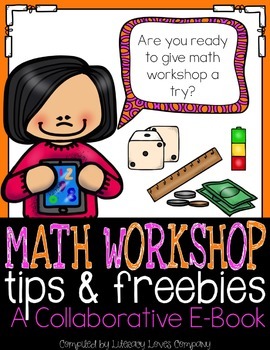 • Each page contains a tip, a freebie, a link to a paid product, and some pages have links to blog posts for more information about math workshop. • Before leaving ratings, please remember that this is a FREE collaborative e-book. No one single person is responsible for the content or resources. • Please feel free to share this resource with your teaching colleagues.